In keeping with our "Cats Rule, Dogs Drool" theme from our blog post yesterday, Cody and I are proud to present to you the brilliantly witty book: Stanley & Katrina, The Perpetual Papers of the Pack of Pets which was cleverly pawed penned by the "stars" of this quick and entertaining read Stanley & Katrina themselves! Who are Stanley & Katrina? "Katrina is an eight -year-old grey tabby cat who loves her toy mouse. Stanley is a three-year-old black Labrador/Rottweiler mix who does his best to ignore Katrina. Morty, a bunny, assists in narration of their story." 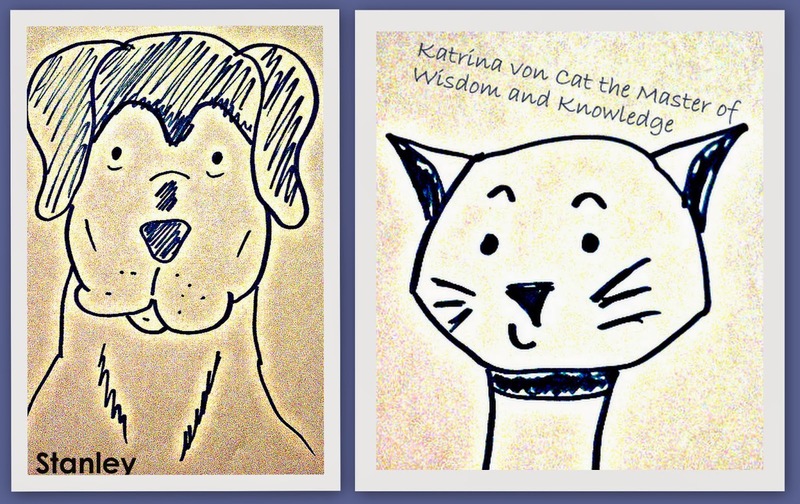 Though they reside in the same house, Stanley and Katrina's preferred method of communicating is through letters which are initiated by Katrina, who prefers to be addressed by her OFFICIAL name: Katrina Von Cat the Master of Wisdom and Knowledge, Get the picture? Poor Stanley doesn't stand a chance! 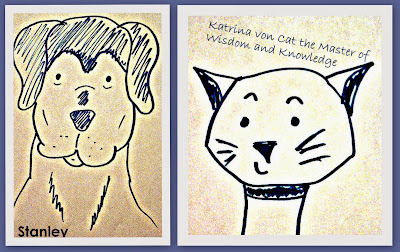 Katrina is also "a proper member of the Wise Cat Council." Just wait until you read the book to see who the other members of the council are! This book features letters that deal with topics that are not only the most pressing topics in both the lives of Stanley & Katrina, but in the lives of cats and dogs in general! The Cat Council-where you will meet the council "members"
Training-where Katrina discusses with Stanley that she doesn't understand why HE gets trained and she doesn't! Katrina wants to be trained because it means FREE TREATS!! Katrina was delighted to learn that she was in fact going to be trained, and was thrilled when her name was called to begin, and she got a treat simply for walking into the kitchen! That's a CAT for ya! That's how they roll! Reap the rewards with minimal effort! Just be "cool" and the world is your oyster! If you are looking for a fast read that showcases the relationship between cats and dogs in a witty and sarcastic manner, then this is the book for you! 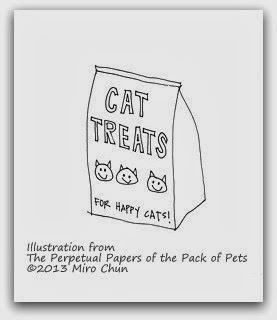 It would make a great gift for the cat lover(s) oh and dog lovers too, that are in your life! Want more? Check out the trailer! 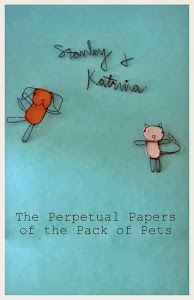 In full disclosure: I won a copy of Stanley & Katrina, The Perpetual Papers of the Pack of Pets on the incredibly well-written and creative blog Create With Joy. Stop over and check them out, you will be glad that you did! All opinions are our own and we thought this book was just too clever! Oh, I love it!!! What a clever premise for a book. The trailer is very clever too! It's no secret we kind of poke fun of dogs here...this looks like a super-fun read! Katie I thought of you the entire time I read it lol! It IS fun! Caren - you are one of the sweetest human bloggers ever. Cody (and Dakota) are lucky to have you. Thank you for your kind words and for sharing our book with your blogging friends. Katie - thank you for the nice words about our trailer. We were very happy with it (and still are). :) Have a paw-riffic day! Looks like a most adorable book.....we love the trailer and are going to visit their website. I think the sending of letters to communicate is a cute "hook" for a charming story! Pam it is and their website is DARLING!!! There is a "secret" there, wait til you see! Sammy (and Pam)! We adore your website and hope you like ours. :) Have a paw-riffic day! This looks like a fun book - and your review is wonderful, as usual! Ingrid it is soooo much fun and their website is precious! Thank you so much about the review!! Bev it is most definitely on both counts! Ooops my comment below was supposed to be here! YourSpecialDog: Yay, a dog! Thank you for the comment. We are happy with the trailer! Anyone who can't wait can get the book 'Stanley & Katrina' on Amazon, for the free Kindle app, for just .99 cents. You could be reading this great book in less than 5 minutes! Don't you love living in the new millennia? How wonderful. This is one of the best comments we have ever read. You are one cool human. Have a paw-riffic day and thanks again! It is and I totally agree, the trailer is amazing! Oh, sweet Caren & Cody, you have made our day! Happy paws, dancing paws! That does look like a terrific and fun book. And what a good review. Hope all of you have a great week end. Take care. Thank you for the kind words, Marg. We are very appreciative of Caren & Cody's paw-some review, as well! That does look like a fun read! We love it when books do trailers! it IS a fun read and we love the trailers too! Helps TON with reviews! Sounds like a cute book! I will have to check it out! Have a paw-riffic holiday season! Thanks for sharing your awesome review. It looks like fun and a good way to market their book. Layla you are most welcome! It is super adorable and the website is as well! Yes, thank you, Caren for sharing your PAW-SOME review! Thanks for the kind comments, Layla! Sounds like a fun book. I was laughing out loud at the trailer. oh Sue it IS fun! Isn't the trailer just hilarious? The book is too! Thank you for the shout-out - I'm so glad you enjoyed your prize! 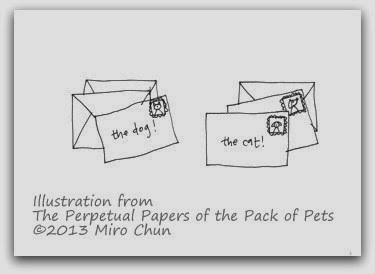 Not only is The Perpetual Papers of the Pack of Pets one of the most delightful books I've come across this year, but the authors are some of the nicest people I've had the pleasure of meeting in the blogosphere! Awww...you two are too much. Thank you for the kind words. You are both amazing bloggers and super cool humans. You are definitely in our top blogger lists for our favorites - hmmm...we have a page to update on our blog. :) Thank you both for bringing so much joy to our household this year. Have a wonderful holiday season! That is a fun video. This book sounds like a fun read, I'm off to visit Amazon. Yay!! Hope you like it! We hope you enjoy our book! Maybe we need to add a squirrel to our next book? What a great book premise! Katrina is pretty and witty. Stan must be dim-witted. HAH! Ah, Cathy is so wise. Joanna it is and thank you! We hope you enjoy our book! We are thankful for Caren & Cody. That really does look like fun! Thank you for the kind comment, Brian. What a stylish hat on your profile picture! This book sounds fantastic! Thanks for letting us know about it, Caren. And that trailer ... MOL!!! We will go check out their website now. Big hugs to you all. We hope you enjoyed visiting our website. Have a paw-riffic holiday season! Sounds like a cute book. It's been on my wish list since its release. Have a lovely Sunday. Hi, Vanessa! We'll be in touch shortly. We love, love, love, Traveling Cats! We didn't forget about your request. :) Have a paw-riffic holiday season! :) Two paws up to Caren's recommendation. it is and you are most welcome!!! Fantastic review! It is especially great for those with multi-lingual pets (i.e. bark, meow). I will put it on my list anyway because we are dog lovers here, too. We just don't have a dog. Jobi thank you so much!!! Oh I know you love dogs too!! Yay for dog AND cat lovers! We hope you enjoy our book, Jobi! Wow! We loved the video.This looks like it would be a great book to read! We are happy that you like our video. Have a paw-riffic rest of the year and 2014.
thanks so much Athena! It is adorable, I think you would like it! Sounds really great, love the concept of letters and the illustrations. Hi, Clooney. We are fans of the letters, too, and our illustrator is wonderful. She did a great job for us. Our paws don't draw very well. :) Thanks for commenting on our book review and we hope you have a paw-riffic day!